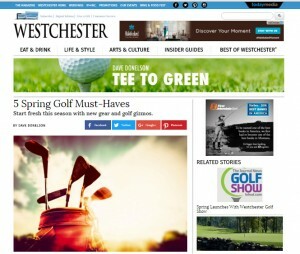 The Sun Mountain Cumulus jacket was featured in this month’s edition of Westchester Magazine as one of the five must haves for the 2016 golf season. The super lightweight and breathable golf rain jacket is back pleated to make sure your motion isn’t limited, and also has a deeper front zipper and side zipper for easy on and off when you get hit by the spring showers. This Cumulus model with shorter sleeves has been added to the Sun Mountain outerwear line after the original came in long sleeves.